Link to full report here. A weak jobs report pulled down the Oregon Measure of Economic Activity in August to -0.09 from 1.37, but the decline is not reflective of underlying economic trends. The three-month moving average remained solidly in expansionary territory at 0.93 (“zero” indicates average growth over the 1990-present period). Of the four major sectors comprising the index, only the service sector, containing only employment components, made a negative contribution. Throughout the measure, weak employment components accounted for virtually all of the negative contributions. 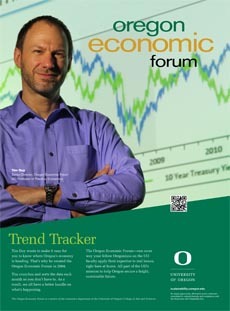 The University of Oregon Index of Economic Indicators slipped in August, reversing most of the July gain. The recent sideways movement of the UO Index suggests the economy is in a mature stage of the business cycle. Softer employment services payrolls (largely temporary employment), Oregon weight distance tax (a measure of trucking activity), a modest decline in average weekly hours in the manufacturing sector, and a narrower interest rate spread accounted for the decline. Note that the core (nondefense, nonaircraft) manufacturing new orders have remained in a fairly steady upward trend since May of 2016; the sector continues to recover from weakness in 2015 and early 2016 and indicates business investment is growing. Previous Article← Early Bird Registration Ending Soon!